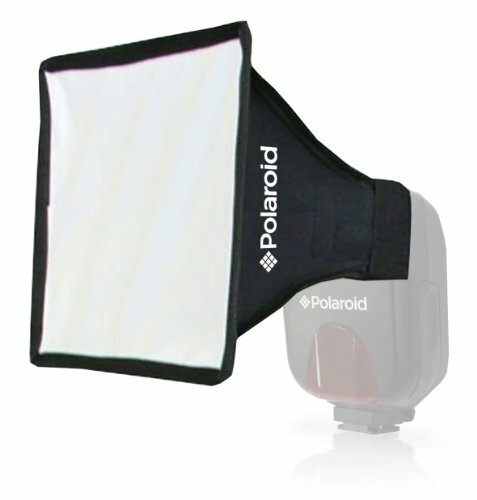 The Polaroid Soft Box Diffuser is designed to increase the quality of light from your shoe mounted flash unit. It features a reflective silver cloth interior which bounces the flash units light off eight aluminized panels. The light is directed out through a thin, white nylon diffuser screen in hundreds of directions. The results are a softer, more natural looking reflection off the subjects surface and lighter shadows. Assembly is a snap! It is held in place with the built-in elastic band. You can also use it without the diffuser front for a bare bulb effect. The soft box folds flat to conveniently fit in your gear bag. Additional diffusion can be obtained by reaching inside the soft box and pulling up the rectangular diffuser cloth which covers one of the four aluminized reflectors. A hook and loop fastener is provided to keep the cloth strip attached to the opening of the soft box and thereby placing it directly in front of your flash's window.